Personalized Gifts: Personalizing your gift is a big trend in todays world. Creating memories and then using those images in creative ways like printing your pics on a pillow, mug, clock, keychains and lots more are few ideas of personalizing the gift. On Raksha Bandhan many siblings get their childhood pics framed in unique ways to cherish memories and gift it to their siblings. Adding a personalizing touch always helps convey the message to your loved one. 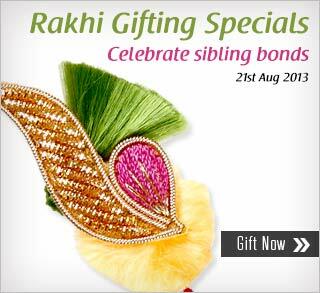 Exclusive Rakhi Hampers: Many websites come up with Exclusive Rakhi Hampers for brothers and sisters. Hampers for brothers always inclide a rakhi. Many other kinds of hampers for brothers include, traditional kurtas, mithais, dryfruits, electronics and lots more. On the other hand, for sisters hampers include chocolates , make up items, apparel, jewelry and lots more. The variety for these hampers is infinite. Gourmet Hampers: Gourmet hampers are a tradition in every Indian festival. Similarly on Rakhi, people gift gourmet hampers containing sweets, chocolates, and other snacks items. Many of these also come along with a pooja thaali and rakhi for brothers. Gift Certificates: Well, if you aren’t sure of what your sibling has been wanting since long, or can’t make up your mind, you can always gift them a gift voucher of their favourite store and help them buy what they like. Gift certificates always play as a safe gift and can be given in any amount to wish to put in . Floral Hampers: Floral hampers of various kind come with mithais ,cakes, chocolates, rachis and more. Most websites deliver these hampers within 24 hours so it becomes for easy for siblings who stay far away and don’t have much time to send gifts. ← It’s never too early to send your Rakhi gift!